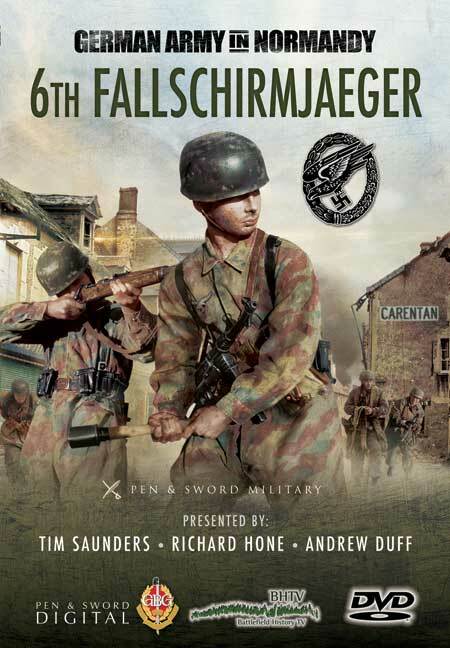 You'll be £16.99 closer to your next £10.00 credit when you purchase The Germans in Normandy: 6th Fallschirmjaeger. What's this? Order within the next 8 hours, 45 minutes to get your order processed the next working day! The German paratroopers established a reputation in Crete as an elite force. A battalion commander now led a new Fallschirmjäger regiment, deployed to Normandy in the spring of 1944 to the very area where the US Paratroopers were to drop on D Day. This DVD will tell the story of this regiment, one that was more like a pocket division than a regiment, and its six day battle around the base of the Cotentin Peninsula to prevent the effective link up between Omaha and Utah Beaches. Using the established and popular style of expert interviews, pieces filmed on the ground where the battle happened, illustrated with contemporary re-enactment footage and numerous maps, the story of the part played by the 6th Fallschirmjäger in the key engagements against the 101st Airborne Division around Saint-Come-du-Mont, the flooded marshes and the key town of Carentan will be told in graphic and controversial detail. Another superb documentary from the Battlefield History TV team, focusing on the impressive performance of the 6th Fallschirmjaeger Regiment in Normandy. It begins by examining the formation of Germany's airborne troops and their experience in Crete, Russia and Italy, paying close attention to their highly capable and chivalrous commander, whose impact on their training cannot be understated. The movements of the Regiment on D-Day are superbly described, from the unsuccessful counter-attack against the 101st Airborne Division to the disastrous withdrawal to St Come du Mont where one battalion was destroyed. Driven back to Carentan, a pivotal town dominating the flooded ground between the Omaha and Utah beaches, the heavily outnumbered paratroopers fought a series of skilful and brutal engagements which imposed a serious delay on the American advance. Surrounded and out of ammunition, the "Lions of Carentan" were eventually compelled to break out and take their place in the front line, fighting a number of brilliant defensive and counter-attacking actions until, the German front line being broken to their east, they narrowly escaped again to regroup deeper inside France, having lost all but a few dozen of the 4,000 men who started the campaign.